For officers who served at Cannon Row Police Station, 'A' or Whitehall Division, London S.W.1. Welcome to ALPHA DELTA PLUS a web site for officers who served at Cannon Row Police Station, 'A' or Whitehall Division, London S.W.1. ENGLAND, UNITED KINGDOM. Officers who served at other stations on 'A' are also invited to participate. 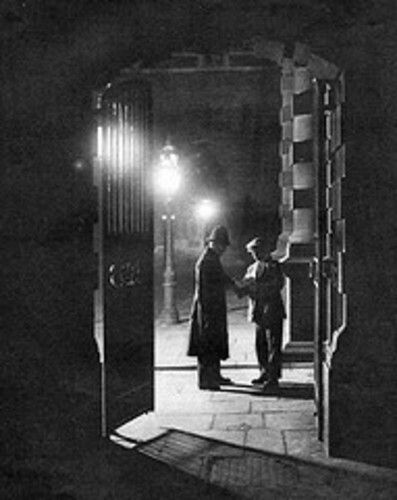 Visitors from around the World are cordially invited to view our pages full of memories of the 'old days' spent at a famous London Police Station. Cannon Row was one of The Metropolitan Police's more famous Central London Police Stations and formed part of the famous New Scotland Yard building designed by the highly regarded architect Norman Shaw (see image at right) in 1898. Cannon Row Police Station opened its doors for 'business' in 1902 and finally closed in 1992 when it was amalgamated with Bow Street Police Station forming a new station, 'Charing Cross', close to the Strand WC2. The code for the station was "AD" hence we arrive at "Alpha Delta". The 'plus' in our title refers to other units or residences that were AD's responsibility to police. Click here for a panoramic view of Cannon Row Police Station as it is today. RIGHT: New Scotland Yard, Victoria Embankment, London. Designed in Gothic style by famed Scottish architect Norman Shaw in 1898. Cannon Row Police Station formed part of this magnificent building (click on this image for 'SIGNPOST' Express Navigation). If you served at Alpha Delta and have fond ( or otherwise) memories of your time spent there please let us know. If you served at other establishments for which AD took responsibility i.e. No 10, Downing Street, Palace of Westminster, Buckingham Palace, Clarence House, York House, St. James's Palace, Wellington Arch (AW), Hyde Park (AH), Great Scotland Yard (GY), The Ceremonials Office that dealt with all the major events on AD's ground, or Windsor Castle that was manned by officers from 'AD's strength.................... WE WANT TO HEAR FROM YOU.....SO MAKE CONTACT NOW! YOU WILL NOT BE ABLE TO 'SKIP' THROUGH THIS SITE AS IT IS DESIGNED TO BE ARCHIVAL AND THEREFORE CONTAINS LARGE AMOUNTS OF ITEMS AND INFORMATION. There must be hundreds of stories that can be told (and some that can't! ) so why not share them with others who have served at Cannon Row. Remember, they don't have to be just the happy memories, of which there were many, just ones that we can all relate to.They can be as short or as long as you wish . We are the FIRST era of retired Metropolitan Police Officers to be able to take advantage of the internet to communicate with one another so let's use it to it's full potential. MAKE CONTACT WITH ALPHA DELTA PLUS NOW! BY ITS VERY NATURE THIS SITE IS INTENDED TO BE ARCHIVAL. PLEASE DON'T EXPECT DRAMATIC CHANGES TO ITS APPEARANCE. IF YOU SUPPLY YOUR EMAIL ADDRESS YOU WILL BE NOTIFIED OF ANY CHANGES THUS ELIMINATING THE NEED TO 'TRAWL' THE WHOLE SITE FOR NEW CONTRIBUTIONS. CHECK OUT THE TOP FIVE 'SENIOR' CONTRIBUTORS TO THE SITE IN WARRANT NUMBER ORDER ..... CAN YOU GET INTO THE TOP FIVE??? SO FAR WE HAVE HAD MANY CONTRIBUTIONS FROM AROUND THE GLOBE. WHO ARE THE TOP FIVE MOST SENIOR (by Warrant Number, NOT AGE or RANK) CONTRIBUTORS WE HAVE HEARD FROM VIA THE INTERNET? No 5: PC 136'A'/135559 Alan FRANCIS (1950-56). If your warrant number is lower than the above Ex 'A' Officers and you have made contact with the web site via the internet then let us know. MAKE CONTACT WITH EX COLLEAGUES AND FRIENDS FROM 'A' NOW! Please state your 'A' Divisional Number/ Warrant Number and dates served. IF YOU WOULD LIKE TO BE ADDED TO THE ALPHA DELTA PLUS EMAIL DATABASE TO BE NOTIFIED WHEN NEW ITEMS ARE PLACED ON THE SITE, SIMPLY EMAIL ALPHA DELTA PLUS REQUESTING AN UPDATE EMAIL. FOR EXPRESS NAVIGATION TO OTHER PAGES SELECT 'SIGNPOST' (EXPRESS NAVIGATION) FROM THE MENU AT THE TOP OF THIS PAGE. ONCE THERE YOU CAN NAVIGATE THE WHOLE WEB SITE QUICKLY AND EASILY. With your continued support and input the site will remain lively and anecdotal. Select 'SIGNPOST' (Express Navigation) from main menu at top of this page for FAST links to ALL pages within ALPHA DELTA PLUS, make 'SIGNPOST' your base and navigate around the whole site quickly and easily and view 'HOW WE LOOK TODAY' (1) and (2), 'GENERAL 'A' PICTURES 2,3,4, and 5, 'EAMON'S CORNER', 'MORE MEMORIES', 'HYDE PARK', 'PALACE of WESTMINSTER PHOTO GALLERY' also a page dedicated to Officers memories of H.M. Queen Elizabeth, The Queen Mother, and the very latest additions 'MUSICAL MEMORIES of 'A'', '21st CENTURY....AD', 'POINTS of VIEW', 'VICTORIAN and EDWARDIAN AD' ...... AND LOTS LOTS MORE!! Alpha Delta Plus highly recommends 'THE LONDON POLICE PENSIONER' Magazine to all retired London Police Officers. If you are not receiving this magazine then you are missing a veritable treat. Make sure you arrange for it to be delivered to your door. A magazine that is a MUST for the retired Police Officer. Unlike the LPP the NARPO magazine deals with all things nationally that may affect our retirement. Ex PC 503'A'/144887 Jack Bunker who served on 'A' Division from 1957 to 1964 has produced a definitive history of police communications. The book offers a detailed history of methods and equipment from the early watchman's rattle to today's more sophisticated communication system. A few copies of this excellent book are available from Jack for 5 pounds each.